The gallery is open on holiday Mondays, such as Easter Monday, Family Day, other long weekends and during school breaks. 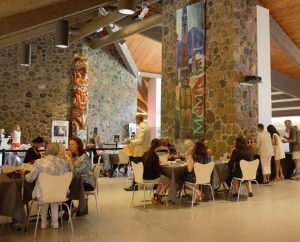 The McMichael Canadian Art Collection is in the charming Village of Kleinburg, approximately a 30 minute drive from the city of Toronto. Use the Google Map tool above to get directions to the gallery – by public transit, car, or bike! – from wherever you are. The McMichael is located on the original lands of the Ojibwe Anishinaabe People. It is uniquely situated along the Carrying Place Trail which historically provided an integral connection for Aboriginal people between Ontario’s Lakeshore and the Lake Simcoe-Georgian Bay Region. As an institution, McMichael recognizes the importance of acknowledging the original territories of the Ojibwe Anishinaabe First Nations people. Customized tours can be arranged for groups of 15 or more – we will be thrilled to plan a day that meets your group’s interests, providing a unique art-viewing experience in a natural setting. Choose a tour of the permanent collection or special exhibitions, enjoy an art workshop or a presentation. Email bookings@mcmichael.com to start planning. Please note that no public tours will be offered on Good Friday, April 19, 2019. The gallery remains open through the Easter Weekend. Listen to our audio guided tour. Learn significant facts, insights and details about key landmarks while walking the grounds of the gallery. Enjoy the McMichael in a whole new way! To listen to our audio guided tour, please click on the link below. Our restaurant takes inspiration from local produce, seasonal harvests, and international flavours. Drawing inspiration from artwork featured in the McMichael’s exhibitions, the feature menus are designed to incorporate seasonal colours and vibrant aspects portrayed by the artists. The restaurant has floor-to-ceiling windows overlooking the forested Humber River Valley, the perfect backdrop for an afternoon snack or hearty meal. Exciting changes are coming to the dining experience at the McMichael. As of April 1, 2019, the McMichael will be working with a new food services partner and we look forward to sharing more details about this announcement soon. In the meantime, please expect reduced restaurant service during the coming weeks, although sandwiches, salads and other treats will still be available. Thank you in advance for your understanding and stay tuned for more information about our full restaurant relaunch! With over 100 acres of stunning woodland, our grounds have kilometres of trails perfect for hikers, naturalists, walkers and mountain bikers. The paths wind their way through natural stands of maple, oak and pine, alongside the Humber River to Binder Twine Park. Some of trails are wheelchair accessible – feel free to view our accessibility page or contact us for more information. The nearby Kortright Conservation Centre, with its network of groomed forest trails, is connected to the gallery land.